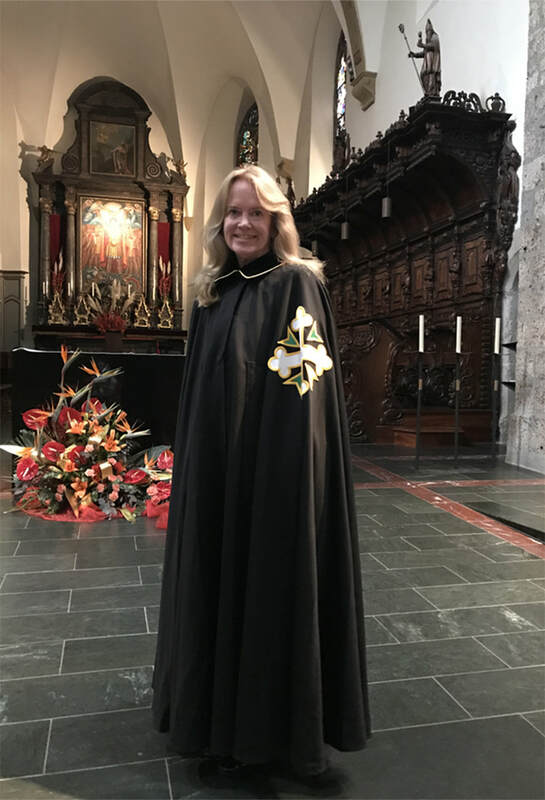 To emphasize and facilitate the personal commitment of its members to the spirit and objectives of the Order, the Statutes provide that a limited number of Knights or Dames of Devotion may be appointed among members of the Order. Such members will have already demonstrated particular dedication to the Order and shall undertake a solemn vow, renewable on an annual basis, to serve the Order with special commitment, and consistent with the Order's original Christian purposes, to perform works of a humanitarian nature in the social, medical or charitable spheres. Knights and Dames of Devotion will wear a golden knot of Savoy next to the insignia of their grade. Any such commitment to the Order must be specific and not merely general, in accordance with requirements set forth in published rules and regulations for Knights and Dames of Devotion. The Order of Saints Maurice and Lazarus is a Dynastic Order of the Royal House of Savoy. It was established in 1572 by authority of Pope Gregory XIII in two Papal Bulls issued that year which united two existing Orders of Knighthood, the Order of St. Lazarus of Jerusalem and the Order of St. Maurice. The Order of St. Lazarus has its origins in the Hospital of St. Lazarus of Jerusalem, situated outside the walls of that city, where lepers were cared for by Armenian monks whose devotions followed the rule of St. Basil of Caesarea. About the year 1060, Lay Brothers formed a congregation and served in this hospital, assisting lepers throughout the Holy Land whenever their services were needed. In this highly dedicated mission the Brother Superior himself was often a leper, and many of the Lay Brothers suffered from leprosy. The congregation did not have military responsibilities until 1200, when such duties became necessary for self-protection. In April, 1254, the mission of these Lay Brothers received official recognition by a Papal Bull which confirmed them as members of a Hospitaller and Military Order. In August, 1265, another Papal Bull required that all lazarets (hospitals for persons suffering from leprosy) be placed under the authority of the Order of St. Lazarus of Jerusalem. The Order benefited from the patronage of many Sovereigns and Pontiffs of the time, particularly Clement V, the first of the Popes in Avignon, in 1305. Compelled to leave the Holy Land in 1291, the Order settled in the Kingdom of Naples and Sicily, and in the Kingdom of France, then ruled by King Philip IV. The Order eventually experienced a period of decline as it suffered the loss of its possessions and rivalries for leadership. During the Fifteenth and part of the Sixteenth centuries, its headquarters was the St. Lazarus Hospital near Capua. Attempts at unification with other Orders, by Popes Pius II and Sixtus IV, did not succeed until 1572, when Pope Gregory XIII joined it with the Order of St. Maurice. The French branch of the Order of St. Lazarus refused to comply, only to find itself united, in 1607, with the Order of Notre Dame of Mount Carmel by King Henry IV of France. The Order of Notre Dame of Mount Carmel and St. Lazarus of Jerusalem was officially abolished in 1830 by King Charles X of France and by the Holy See. “Orders of St. Lazarus of Jerusalem” which were subsequently founded by private initiative lack the prerequisite fons honorem, and are neither approved nor recognized by the Vatican. The Order of St. Maurice was founded in 1434, in Ripaille, by Count Amadeus VIII of Savoy, who later became the first Duke of Savoy. Shortly after, in 1439, the Duke was elected as an anti-Pope by the Fathers of the Council of Basel, whereupon he took the name of Pope Felix V.
He abdicated in 1449, after recognizing the authority of Pope Nicholas V in Rome. The purposes of the Order of St. Maurice were to serve God, to lead a monastic life, and to assist in the affairs of the State. The Order experienced periods of inactivity until 1572, when Pope Gregory XIII recognized it as a military-religious Order of Knighthood. The combined Order of Saints Maurice and Lazarus was created in 1572, when Gregory XIII, by means of two Papal Bulls, sanctioned the annexation by the Order of St. Maurice of the Italian Commanderies of the Military Hospitaller Order of St. Lazarus of Jerusalem. The Grand Mastership of the combined Order was bestowed upon Duke Emmanuel Philibert of Savoy and his male descendants. The new Order adopted the rule of St. Augustine, already observed by the Knights of St. Maurice, and included among its objectives, the defense of the Holy See. The combined Order prospered from the support of the House of Savoy and the Papacy. It was regarded with such high esteem that many European Sovereigns urged their more illustrious noblemen to seek admission. Over the centuries the Order was successful in many areas for the good of mankind and in extending its secular powers. In 1868 the first King of Italy, Victor Emmanuel II, reformed the Order to more closely resemble an Order of Merit, with equally illustrious prestige. When the reign of the House of Savoy ended in 1946, and the King, Umberto II, left Italy to go into exile, he took with him, as hereditary Grand Master, the Order of Sts. Maurice and Lazarus, and continued to bestow it from abroad. Thus, the Order continued to be conferred upon Cardinals, Sovereigns, and Heads of State, and was also received by high ranking Italian government officials. The Holy See continued to recognize the King as Grand Master of the Order, its dynastic nature, and its historic achievements. King Umberto II died in exile on March 18th, 1983. The Grand Mastership of the Order of Sts. 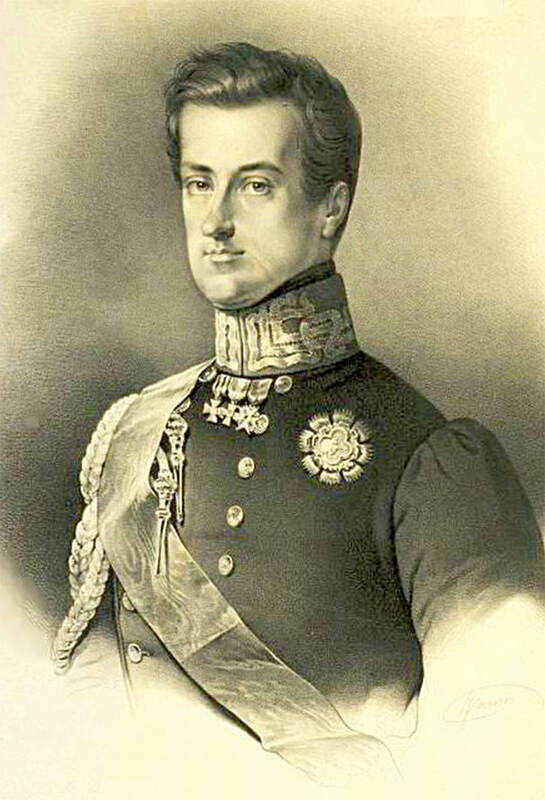 Maurice and Lazarus passed by hereditary right to the King’s son, Prince Victor Emmanuel, who became the Head of the Royal House of Savoy on the death of his father. The Order of Sts. Maurice and Lazarus continues to flourish as a Catholic Dynastic Order, bestowed by a legitimate Prince, Victor Emmanuel of Savoy, the seventeenth of his family to serve as Grand Master, in a succession recognized by the Holy See. The Order’s purposes are both humanitarian and philanthropic. These objectives, which were established at the time the Order was founded, were later expanded, but, nevertheless remain constant even in our own time. Moreover, the Order continues to recognize those who make significant contributions to science, literature, the arts, industry, trade, scholarship and research, the liberal arts, the professions, public service, and other worthy fields of endeavor, which bring honor and greatness to the House of Savoy and benefits to humanity. By magisterial decree, there may be established for worthy recipients an Honorary Commandery of Jus Patronatus, with corresponding titles of Commanders of Honor Jus Patronatus. A limited number of Knights or Dames of Devotion may be appointed among Members of the Order. Such members will have already demonstrated particular dedication to the Order and shall undertake, by solemn vow, renewable on an annual basis, to serve the Order with special commitment, and consistent with the Order’s original purposes, to perform works of a humanitarian nature in the social, medical or charitable spheres. Admission to the Order, regardless of the nationality of the candidate, shall be either by Magisterial Motu Proprio, or based upon the recommendation of the Council or the Commission of the Order. The annual quota for admissions shall be limited to three Knights Grand Cross with Grand Cordon, one Dame Grand Cross with Grand Cordon, six Grand Officers, twelve Commanders, and eight Dame Commanders. There shall be a category of Devotees of Merit with medals in gold, silver and bronze, which shall be composed of individuals who, while not members of the Order, have made commitments to perform charitable works for the Order, or who have already demonstrated, through their charitable works, a particular affinity for the Order. Admission to the Order shall be effective upon registration of a Decree of Nomination at the Chancellery of the Order. Prior thereto, candidates shall refrain from wearing the Order’s insignia. The insignia of the Order shall consist of a white enamel Cross of Saint Maurice superimposed on the emerald green Cross of Saint Lazarus. The insignia of Devotees of Merit shall consist of a medal with the Cross of the Order in relief. The insignia of the grades of the Order are described in Appendix A annexed hereto which is incorporated herein by reference and made a part of these Statutes. Members of the Order may wear its ceremonial robe only with prior approval requested or authorized by the Grand Chancellor and only for religious ceremonies. The ceremonial (church) robe is described in Appendix B annexed hereto which is incorporated herein by reference and made a part of these Statutes. The Grand Master of the Order is Supreme Head of the Grand Magistry, and administers the Order through the following: The Council, the Commission, the Grand Chancellor, the Grand Treasurer, and the Grand Prior of the Order. 5 - To provide advice and recommendations on other matters as may arise. The Council of the Order is composed of: the Grand Chancellor, the Grand Treasurer, the Grand Prior and six other councilors nominated by the Grand Master, from among the Order’s Knights and Dames Grand Cross with Grand Cordon, its Grand Officers, its Commanders, its Dame Commanders, and its Knights or Dames of Devotion. Each council member shall serve for a three-year term, which may be extended for two additional non- renewable periods of not more than three years each. The Grand Master shall appoint two members of the Council to serve as President and Vice President. The Grand Chancellor shall have the responsibility of submitting reports to the Council. The President and the Council may designate to one or more Councilors the responsibility of investigating or taking action as to matters upon which the Council may deliberate. The Council shall elect, from among its members, a Secretary, whose task it will be to record the minutes of its sessions. Notices of meetings of the Council shall be sent upon the initiative of the Grand Master, the President, or the Vice President, and by prior arrangement with the Grand Chancellor. 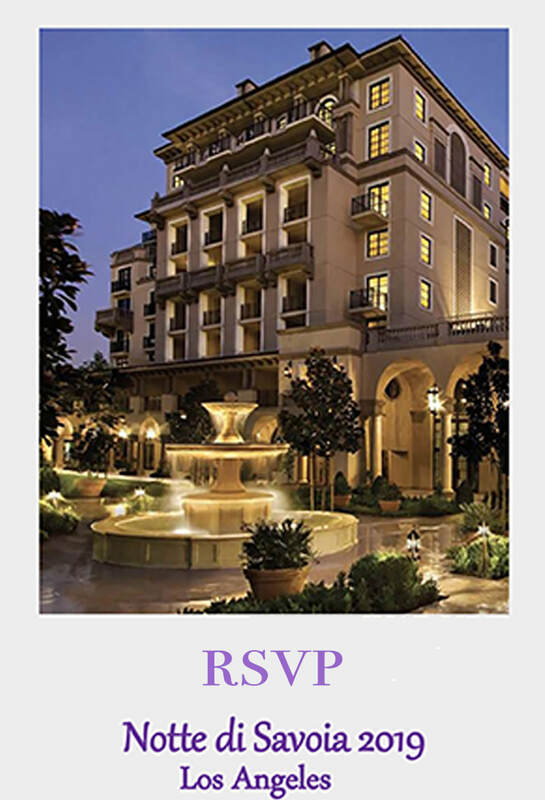 Notices of meetings must be received not later than fifteen (15) days prior to the dates on which the meetings are scheduled to be held. Except in special cases, meetings of the Council shall be held at the Chancellery of the Order. A quorum consisting of at least four members of the Council, including the President, in attendance, shall be required in order to conduct the business of the Council. The Commission of the Order shall consist of five members appointed on recommendation of the Council and by Magisterial decree. Each member of the Commission shall serve for a three-year term, which may be extended for two additional non-renewable terms of not more than three years each. The Grand Master shall appoint two members of the Commission to serve as President and Secretary. A quorum consisting of at least three members of the Commission including the President, in attendance, shall be required in order to conduct the business of the Commission. The duties of the Commission are to verify that candidates proposed for admission to the Order conform to the standards established in its Statutes and Rules. The Commission’s reports and recommendations concerning proposals for admission to the Order, regardless of whether these proposals have been approved, shall be presented by the Grand Chancellor to the Grand Master. Decrees of admission shall explicitly set forth the Commission’s favorable recommendations, except in cases of admission by Magisterial Motu Proprio. In special cases, the Commission may deliberate and decide upon matters that are normally the responsibility of the Council. In such cases the Council must ratify such deliberations and decisions at its next meeting. The Grand Chancellor is chief administrator of the Chancellery of the Order. He shall be custodian of the Seals of the Order. These shall be affixed, in his presence, to all Magisterial and Council decrees; he shall countersign all Magisterial decrees of admission to the Order signed by the Grand Master; he shall report to the Grand Master on the deliberations of the Council and of the Commission, and he shall ensure that these contain nothing inappropriate or offensive to the Grand Master or to the dignity and interests of the Order. He shall further ensure that all documents concerning the Order are diligently preserved in the Order’s archives; he shall safeguard and defend the rights and privileges of the Order and shall act as it’s legal representative. He shall be responsible for supervising the ceremonial activities of the Order. The Grand Treasurer shall supervise every aspect of the administration of the Order’s properties and holdings. diligently maintained. He shall direct the collection of all monies due to the Order and shall make recommendations to the Council on matters he deems necessary to improve the administration of the Order. The Grand Treasurer shall report to the Council on all budgetary matters, on accounts presented by financial advisors and custodians of the Order’s funds, on general administrative matters, and on disbursement of balances remaining at the close of each fiscal period. In consultation with the Grand Chancellor, the Grand Treasurer shall determine the temporary uses of disposable funds. 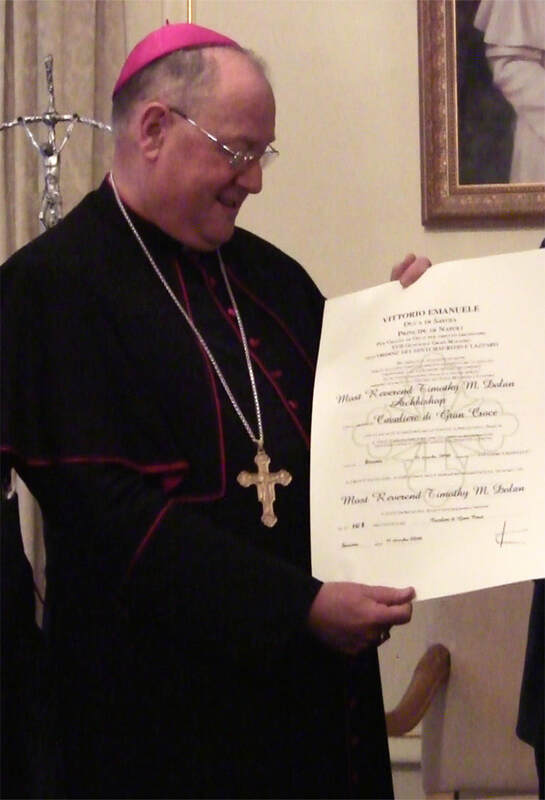 The Grand Prior shall exercise the rights and prerogatives conferred upon him by Papal Bull pertaining to the Order. He shall supervise all matters pertaining to Divine Worship, as well as to the observance of the moral code of the Order. A member whose conduct is lacking in honor and loyalty toward the Order and its governing principles, or towards the House of Savoy, shall be struck from the register of the Order and deprived of the right to wear the insignia and use the titles of the Order. Revocation of membership in the Order shall be effected by Magisterial Decree and a decision of the Council of the Order. Prior to reaching its decision, the Council shall, through its President, notify the member of its intention to revoke membership in the Order and the reasons therefor, and shall establish a deadline for receipt of a written response from the member. This procedure shall not be necessary if the allegation against the member is established by documents of indisputable authority or has been confirmed by court ruling. Knights Grand Cross with Grand Cordon. Sash: worn from the right shoulder to the left hip; made of emerald green silk, 100mm in width, fastened with a bow. To this is pendant a 67 mm wide white enameled botonnée Cross, edged in gold, superimposed on a transparent emerald green Maltese Cross. The Cross is surmounted by a gold royal crown measuring 42 mm across. Breast star: made of silver with eight groups of short, diamond-cut rays measuring 85 mm in diameter, superimposed with a 55 mm Cross of the Order. Miniature: a 13 mm miniature of the breast star is pendant from an emerald green silk ribbon. Rosette: a miniature of the breast star in the center of an emerald green 12mm wide rosette. Uniform ribbon: emerald green silk 37 mm in width, superimposed with three royal crowns in gold. Neck ribbon: emerald green silk, 50 mm wide from which a 55 mm Cross of the Order surmounted by a 38 mm wide royal crown is pendant. Breast star: silver with four groups of short diamond-cut rays, 75 mm in diameter, upon which a 41 mm Cross of the Order is superimposed. Miniature: a 16 mm miniature of the breast star from which a 13 mm emerald green silk ribbon is pendant. Rosette: a miniature of the breast star in the center of a 12 mm emerald green silk rosette. Uniform ribbon: a 37 mm wide band of emerald green silk with two royal crowns in gold superimposed. Neck ribbon: emerald green silk, 50 mm wide, from which a 55 mm Cross of the Order surmounted by a 38 mm royal crown is pendant. Miniature: a 16 mm Cross of the Order surmounted by a gold royal crown pendant from an emerald green silk ribbon 13 mm wide, upon which is superimposed a single gold crown. Rosette: a gold royal crown at the center of a 12 mm emerald green silk rosette. Uniform ribbon: 37 mm wide emerald green silk surmounted by a gold royal crown, with the Cross of the Order with gold royal crown pendant. Uniform ribbon: a 37 mm wide band of emerald green silk. Miniature: a 16 mm miniaturization of the Cross of the Order surmounted by a gold royal crown pendant from an emerald green silk ribbon 13 mm wide. Rosette: a silver royal crown at the center of a 12 mm emerald green silk rosette. Uniform ribbon: 37 mm wide emerald green silk ribbon with Cross of the Order with a gold crown pendant. Miniature: a 16 mm miniature of the Cross of the Order pendant from an emerald green silk ribbon 13 mm wide. Rosette: a 12 mm wide emerald green silk rosette. Uniform ribbon: 37 mm wide emerald green silk ribbon with the Cross of the Order (without gold crown) pendant. Sash: worn from the right shoulder to the left hip, made of 50 mm wide emerald green silk, ending in a bow from which is pendant a 55 mm wide Cross of the Order, surmounted by a 38 mm wide gold royal crown. Miniature: a 16 mm miniaturize of the Cross of the Order surmounted by a gold royal crown, suspended from an emerald green silk ribbon with a 13 mm wide bow with serrated fringe. Ribbon: a 37 mm wide emerald green silk ribbon in the form of a bow, from which a 41 mm Cross of the Order surmounted by a 16 mm gold royal crown is pendant. Miniature: a 16 mm Cross of the Order surmounted by a gold royal crown pendant from an emerald green silk ribbon with a 13 mm bow. Ribbon: emerald green silk, 37 mm wide in the form of a bow from which a 41 mm Cross of the Order, without crown, is pendant. Miniature: a 16 mm miniature of the Cross of the Order, without crown, pendant from a bow of emerald green silk ribbon 13 mm wide. Neck Ribbon: the same as Commander. Breast star: a 55 mm Cross of the Order (without rays). Miniature: the same as Commander, but bearing a miniature of the breast star in lieu of the royal crown. Rosette: the Cross of the Order at the center of a 12 mm emerald green silk rosette. Uniform ribbon: 37 mm emerald green silk with the Cross of the Order at its center. A golden Savoy Knot is worn next to the insignia of their grade in the Order. bears a Cross of the Order, in relief, without enamel. On the reverse side, at the top, the words “Bene Merenti” are inscribed. A space below the inscription is provided for the recipient to engrave his or her name and the date of presentation of the medal. Miniature: a 13 mm emerald green silk ribbon, from which a medal 16 mm in diameter is pendant. Lapel Pin: a bow of 13 mm wide emerald green silk. Medals are of gold, silver or bronze. Gold-medal holders wear a gold star at the center of the bow; silver medal holders, a silver star at the center of the bow, bronze medal holders wear a bow without star. The men’s church robe of the Order for all grades will be of crimson silk with white trim (collar and cuffs), a fabric Cross of the Order edged with yellow-gold silk embroidery, and a wide cordon ending in two tassels in front. Knights Grand Cross with Grand Cordon, Grand Officers and Commanders of Honor (Jus Patronatus), wear an embroidered fabric breast star in accordance with their grade in the Order: the royal crown embroidered in gold for Commanders: in silver for Officers. Dames wear a black silk cloak and small black velvet collar with fine gold edging. On the left side there is sewn a Cross of the Order in fabric embroidered with yellow-gold silk edging. The origins of the combined Order of Sts. Maurice and Lazarus derive from a Papal Bull issued by Pope Gregory XIII. At its inception, the Order reflected the political and religious concerns of the 16th Century. Therefore, its goals included both defense against Muslim military forces in the Mediterranean region and the “heretics” in Europe, as well as the care of those suffering from leprosy. By sending a fleet to patrol the waters of the Mediterranean, and by opening leprosariums and hospitals, the Order acquitted itself of both tasks with distinction. The French Revolution, the shock waves of which were felt throughout Europe from the fall of the Bastille through the Napoleonic Era, brought fundamental changes to European life and, indeed, to the very nature of the great Orders of Knighthood. The Orders of the House of Savoy were no exception. One of the results of this revolutionary period was that from the reign of King Carlo Alberto (1830-1848) onwards, the Orders were increasingly placed “on loan” to the State. Although this did not change their fundamental juridical status as belonging to the Sovereign (the Head of the Royal House of Savoy), the Orders were administered as though they belonged to both Crown and State. In due course, the gap between the rank of a public official and the grade to which he could hope to aspire within the Order began to narrow. Naturally, with the departure into exile of H.M. King Umberto II in 1946, this system changed. His Majesty continued to decorate individuals who had distinguished themselves, not only through their actions, but also through their complete loyalty to the Sovereign and to the Dynasty. Today, confronting circumstances that have again changed, it is an opportune time for the Order to revert to its original ideals and to rededicate itself in our modern social and historical setting to the purposes for which the two Orders (St. Lazarus and St. Maurice) were initially joined into one Order by the Pope. Of course, today it is no longer a question of defending the Faith “per se,” but rather those fundamental principles which constitute the common heritage of civilization in its noblest and most ecumenical attributes. The mission of the Order is, and must continue to be, to bring assistance, no longer just to those afflicted with leprosy, but to all those who suffer, whether from disease, war, or hunger. In practical terms, the Order embarked upon this route some years ago. Now, the Order must be structured to extend its activities to fulfill its humanitarian ideals. For this reason it is important that membership in the Order should be a matter of personal commitment on the part of each member to work to the best of his or her ability towards a common goal of aiding and comforting the suffering, thus emulating the spirit of chivalry that motivated the ancient orders of knighthood. Article I of the Statutes has, accordingly, been re-written to state: “The Order’s purposes are both humanitarian and philanthropic. These objectives that were established at the time the Order was founded were later expanded; but, nevertheless, remain constant, even in our own time. The emphasis on humanitarian goals, however, does not diminish the Order’s other attributes. It is also worth noting that the words “granting” or “conferral” are no longer used; instead, one is “admitted” to the Order. The Order is aligning itself once again, with the values that have always been the guiding spirit of the great Orders of history, such as the Sovereign Military Order of Malta, to name but one. To emphasize and facilitate the personal commitment of its members to the spirit and objectives of the Order, the new Statutes provide for the creation of: “a limited number of Knights and Dames of Devotion. Such members will have already demonstrated particular dedication to the Order and shall undertake, by solemn vow, renewable on an annual basis, to serve the Order with special commitment and with the Order’s original purposes, to perform works of a humanitarian nature in the social, medical or charitable spheres.” (Article 4). “Knights and Dames of Devotion will wear a golden Knot of Savoy next to the insignia of their grade.” Any such commitment to the Order must be specific and not merely general, in accordance with requirements set forth in published rules and regulations for Knights and Dames of Devotion. To confirm the principle that membership in the Order requires direct, personal involvement, a category of Devotees of Merit has been created. Such persons “...with medals in gold, silver and bronze, shall be composed of individuals who while they are not members of the Order, have made commitments to perform charitable works for the Order, or who have already demonstrated through their charitable works particular affinity for the Order.” (Article 5) This includes those who have not yet performed sufficient acts of merit, even if only by reason of their youth, to become full members of the Order, but who aspire to enter its ranks, or those who have already, in specific instances, contributed towards the Order’s goals. Other amendments to the Statutes are primarily concerned with form. For example, it is stated clearly that the robe of the Order may be worn: “...only with prior approval requested or authorized by the Grand Chancellor and only for religious ceremonies” (Article 9). Other amendments include the following new provisions covering correctly embroidered insignia for men’s robes: none for Knights, a crown embroidered in silver for Officers, and in gold for Commanders. Embroidery for the respective breast insignia for Grand Officers and Knights Grand Cross remain unchanged. This protocol should eliminate, or at least reduce to a minimum, the misunderstandings regarding precedence for procession, or for seating in church. Of greater significance however, is the introduction of a fixed number of members for admission to the Order’s higher grades; limited annually but not in the aggregate. To this effect, Article 5 stipulates: “The annual quota for admissions shall be three Knights Grand Cross with Grand Cordon, One Dame Grand Cross with Grand Cordon, six Grand Officers, twelve Commanders and eight Dame Commanders.” “Annual” means the period between one Chapter of the Order and the next. This limitation in numbers has been enacted so as to emphasize the degree to which membership in the Order, and above all in its higher grades, should reflect, as much the candidate’s desire and commitment to work for the Order’s goals, as the careful evaluation of his or her capabilities by the Grand Magistery. The creation of the Cross of Merit of Savoy is of significant importance. It is intended to reward those who by their actions or deeds are deserving of recognition, but not to the extent that it would be possible for them to be awarded a knighthood. Comparison can be made between the Cross of Merit and the Medal of the Devotees of Merit of the Order of Saints Maurice and Lazarus. The Cross of Merit can also be conferred upon young people who, because of their youth, cannot qualify for entering the Order of Merit. The Crosses of Merit are conferred in two classes: gold and silver. Both resemble the Crosses of the Order, but without enamel. The modifications made to these statutes distinguish between the different purposes of the three Orders. Thus, the Order of Saints Maurice and Lazarus resumes its original role of “sacred militia,” a role it has played for centuries. The Civil Order of Savoy remains virtually the same as when it was conceived and created by H.M. King Carlo Alberto, a recognition of distinguished services in different intellectual fields. 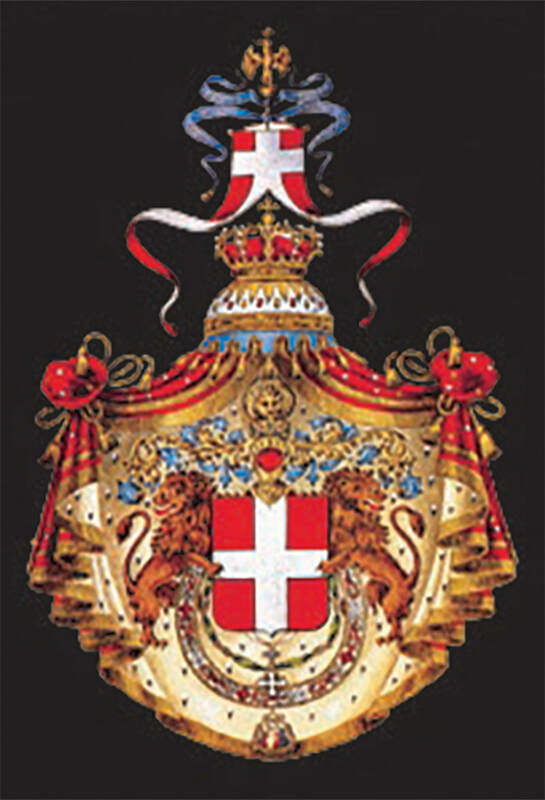 The Order of Merit of Savoy reaffirms its purposes of rewarding “special and specific acts of merit...” benefiting the Royal House of Savoy and towards its Dynastic Head. It is, therefore, impossible to establish any form of “hierarchy” between the three orders. Each has its own distinct character and pursues its own specific goals even if, as is well known, all three are united in the observance of chivalric traditions and loyalty to the House of Savoy.